Andy, thanks for both the kind words and the dwell tables. The table values seem to be close enough to the EZK to work. If anything, the EZK dwell might even be a tad on the high side. 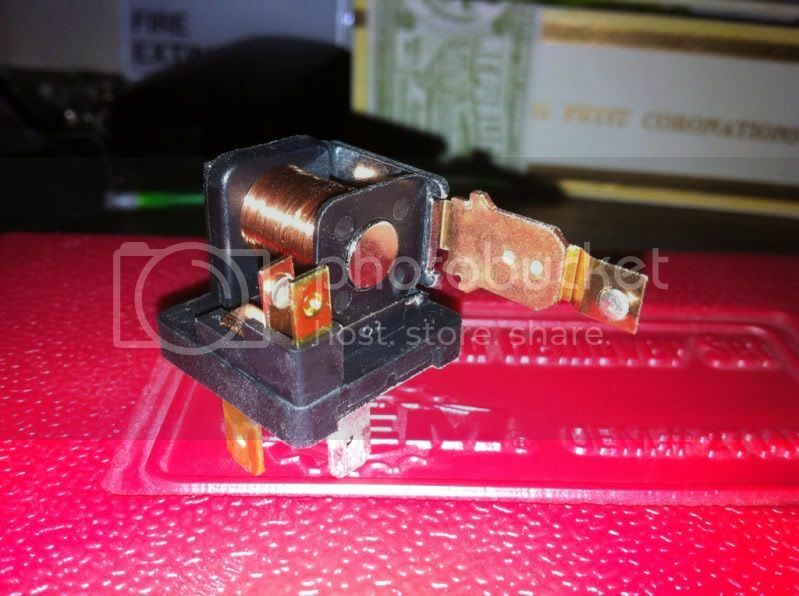 for the people that are not quite sure what Lawrence was talking about when it comes to modifying a generic 30amp relay for the tach out here it is. the copper arm that is sticking out is the piece that you remove. What gauge wire is recomended for the wiring inside the EZK box? and for the output signal as well? 1993 245 B230F <--You can do it! It's all low current TTL stuff. 20 AWG is more than enough. Is there a Masterplan setup for the 16v ? Which coils do fit ? Maybe anyone who can fab some screw on adapters for the plugs? What igniter do i need ? Pretty sure stock plug wires are no problem with it (length wise and coil mounting wise). there's some other options, will post those later. do you have part no's for me? Miata = MX5. Same car. coils, off same car?,unsure of PN. 1st generation NA mx-5, 91+ to like 98? is there a possibility to use coils similar to the ones the b6304f uses? i cant find any j70t2 module in the web... not on google nor on ebay usa... hard to find part? Last edited by MadDog_945; 03-07-2012 at 05:30 AM..
As for using COP coils, that's a whole nother' ballgame. yeah, but if you look on the coils for the miata gen2 they are directly CoP, they should fit... but.. can you "adress" them like the miata gen1 module ? the Bosch 2x2 coil is pretty easy to find (in Germany/NL etc) and works good with the stock dwell times that are mapped in the ezk. not as neat as COP on a 16V but maybe a good alternative for the time being or for longer time. Also nice Bosch quality and works with stock 740/940 cables! How would you address single CoPs? will there be there a difference in wiring ? Last edited by MadDog_945; 03-09-2012 at 08:42 AM..
To limit the current that flows to the base. That's pretty cool! I don't think I've seen anyone yet who's wired up COP's yet with the Board. There's a fellow here that tried them with the LS1 coils and they didn't spark. Probably because not enough dwell or something. I know Kenny had success with triggering Toyota coils off MS LED outputs, and they should be very similar if not identical to how the Buchka stuff is wired up, I don't know for certain though. You should be able to use two wire COP's (no built in igniter). You'll just have to wire them to spark two at a time, cylinder 1&4 and cylinder 2&3. I run VAG COPs, but I have modified dwell map in the EZK for them. More than 10k kms on them. With stock dwell they won't work as they overheat in a mater of minutes and start to missfire. Not using "genuine" buchka module though, but the principle is the same, so it should work perfectly with what you use. In the EZK I use dual 512 bin - can select between vag and stock dwell, and can switch to/from dizzy in a couple of minutes. Attached is the holder plate drawing I laser cut from 1.5 mm stainless steel for VAG COPs - someone asked for dimensions of the 16v head cover. Diameter of the spark plug hole is 32 mm and the holes are not equally spaced..
Whoa ipdown.. thats awesome what coils exactly you run? The ones from 1,4TFSI?